A fuel card refers to a reloadable prepaid card that is used for making payment of expenses related to a vehicle, such as fuel filling, vehicle servicing, vehicle maintenance, and others. These cards gain popularity, owing to the benefits offered such as comprehensive reporting for the fleet of corporates that provide real-time expense track of these fleets. In addition, implementation of fuel cards eliminates manual tasks such as auditing and submitting receipts while profiting the corporate with discounted fuel price offers. The Europe fuel card market was valued at $257,281 million in 2017, and is projected to reach $374,592 million by 2025, registering a CAGR of 5.0% from 2018 to 2025. 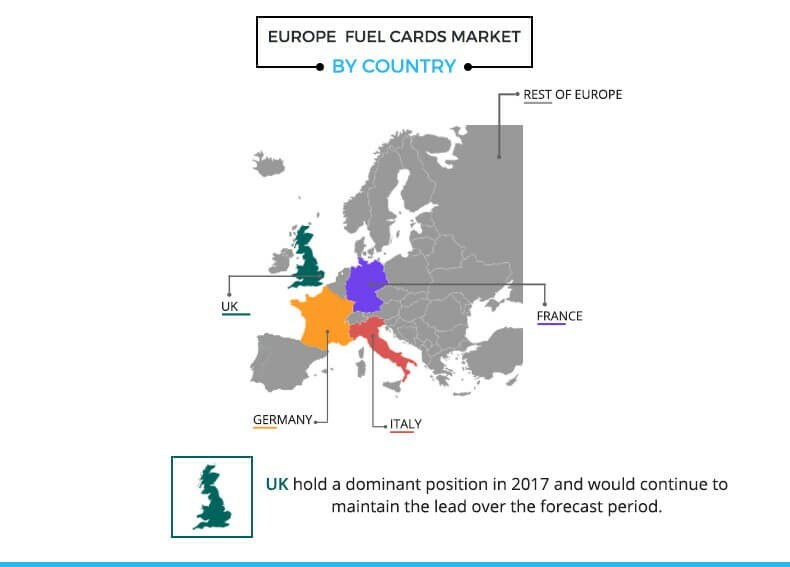 The growth of the Europe fuel card market is driven by the transforming customer experience, owing to rise in adoption of prepaid cards among millennial population. Moreover, increase in preference toward payment digitization and influence of fuel cards in the transportation and logistics industries supplement the market growth. However, security concerns within the fuel card product offerings as compared to that of other payment cards restrain the Europe fuel card market growth. Furthermore, growing prepaid and contactless card industry and rising technological innovations in the fuel card along with the benefits and convenience offered by fuel cards are expected to provide opportunities for the market during the forecast period. The universal fuel card segment dominated the market in 2017 and is expected to continue to continue this trend during the forecast period. However, the merchant fuel card segment is expected to witness highest growth rate, owing to rise in trend of adoption of merchant fuel cards supported by partnerships between fuel merchants and fuel card providers. 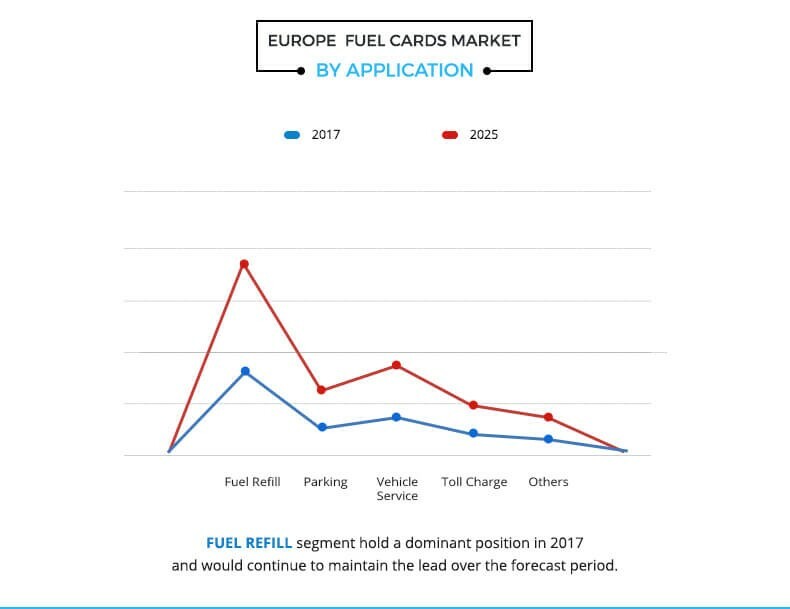 The fuel refill application segment led the overall Europe fuel card market share in 2017, and is expected to maintain its dominance in the near future, owing to rise in adoption of fuel cards for fuel refilling among several business across Europe. UK governed the overall market in 2017, due to increase in fuel thefts and rising cashless fuel transactions. However, Italy is expected to witness the highest growth rate during the forecast period, owing to increasing government regulations for e-invoicing for fuel transactions. The report focuses on the drivers and restraints of the market based on the analysis of regional trends. Moreover, the study provides Porters five forces analysis of the industry to understand the impact of various factors such as bargaining power of suppliers, competitive intensity of competitors, threat of new entrants, threat of substitutes, and bargaining power of buyers on the Europe fuel card market growth. The Europe fuel card market is segmented on the basis of type, application, and country. On the basis of type, the market has been bifurcated into branded, universal and merchant fuel cards. Depending on applications, the market has been divided into fuel refill, parking, vehicle service, toll charge, and others. Country wise, it is analyzed across UK, Germany, France, Italy and Rest of Europe. 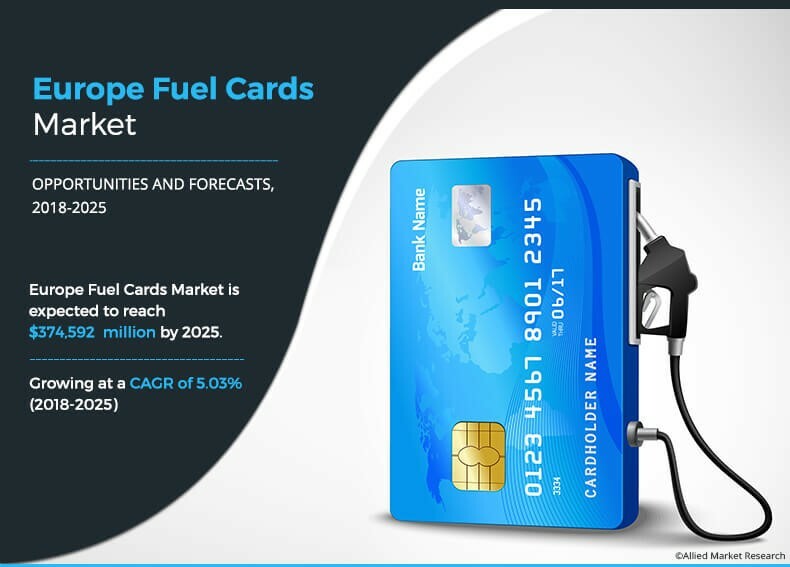 The key players operating in the Europe fuel card market include BP p.l.c, Engen Petroleum Ltd., Exxon Mobil Corporation, FirstRand Bank Limited, FleetCor Technologies, Inc., Libya Oil Holdings Ltd., Puma Energy, Royal Dutch Shell plc, U.S. Bancorp, and WEX, Inc. The Europe fuel card market is influenced by a number of factors, which include rise in need of improved fuel management, increase in penetration of digital transactions, and growth in transportation and logistics industries. However, security concerns associated with fuel cards are expected to hamper the market growth during the forecast period. Moreover, growing prepaid and contactless card industry along with technological innovation in fuel cards provides opportunities for the market growth. However, each factor has its definite impact on the market. 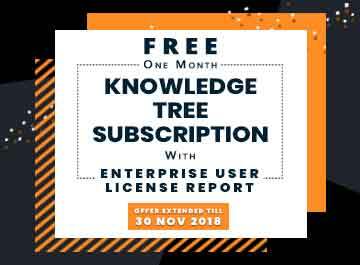 The growth in rate of fleet expenses has increased concerns among fleet owners to secure their unwanted expenditure through optimized fleet management. Implementation of fuel cards enables real-time, actionable insights to prevent unauthorized purchases, fleet spending limits, track of non-fuel purchases, and others. These cards are beneficial to both fleet owners and drivers. In addition, implementation of fuel cards eliminates manual tasks, such as auditing and submitting receipts, while profiting the corporate with discounted fuel price offers. Also, the Europe fuel card market is expected to witness high growth rate during the forecast period, owing to increase in alliances and collaborations among various key vendors and users. Increased inclination of consumers toward digital transaction solutions, such as mobile wallets, prepaid cards, contactless payment, and others, is expected to fuel the market growth during the forecast period; for instance, the total number of non-cash payments across the European Union increased by 8.5% leading to 122 billion in 2016. In addition, card payments accounted for 49% of all transactions, which shows the prevalence of card payments in the region. Moreover, growth in penetration of the mobile payments further increases the market demand. Also, various governments are determined towards supporting implementation of a cashless society. Proliferation of smartphone applications for digital transactions is another factor that supports the growth of the market. The fuel card market faces an increase in threat of being compromised by unauthorized access, which acts as a major restraint for the market. Fleet operators face huge amount of losses every year, owing to fuel card skimming, fraudulent transactions, misuse of cards, and others. Various types of external fuel frauds have been recorded in the recent years; for instance, companies have reported about fraud type Card and PIN Interception by Post in most of the situations. According to Shells report, more than 25% of fleet managers have claimed about high frequency of this type of fuel card fraud. In addition, fuel card cloning has been one of the most-claimed fraud reported by 33% of fleet managers. The rising number of fuel frauds has created concerns for businesses and acts as a major restraint for the Europe fuel card market. Europe has recorded a significant growth in prepaid and contactless payments in the recent years. According to a study conducted by Mastercard, contactless payments on Maestro and Mastercard networks experienced a 145% growth in Europe. In addition, the UK has been dominating the contactless card payment market as more than 112 million contactless cards have been issued in the UK. With the growing trend of contactless cards across Europe, several fuel card companies have been moving towards contactless fuel cards to provide more convenient and secure services; for instance, in February 2017, International Diesel Services introduced the contactless smart fuel card, which incorporates the RFID chip and personal PIN number. With this product launch, the company is determined to establish itself as a most secure fuel solution available in the market. This rising trend is expected to create significant opportunities for the Europe fuel card market during the forecast period. This study includes the analytical depiction of the Europe fuel card market along with current trends and future estimations to determine the imminent investment pockets. The current market is quantitatively analyzed from 2016 to 2025 to highlight the financial competency of the industry. Porters five forces analysis illustrates the potency of buyers & suppliers in the Europe fuel card market industry. 7.6. Libya Oil Holdings Ltd.
A fuel card refers to a reloadable prepaid card, which is used for vehicle-related transactions such as fuel filling, vehicle servicing, vehicle maintenance, and others. These cards have gained increasing popularity, owing to the benefits offered such as comprehensive reporting for the fleet of corporates that provide real-time expense track of these fleets. 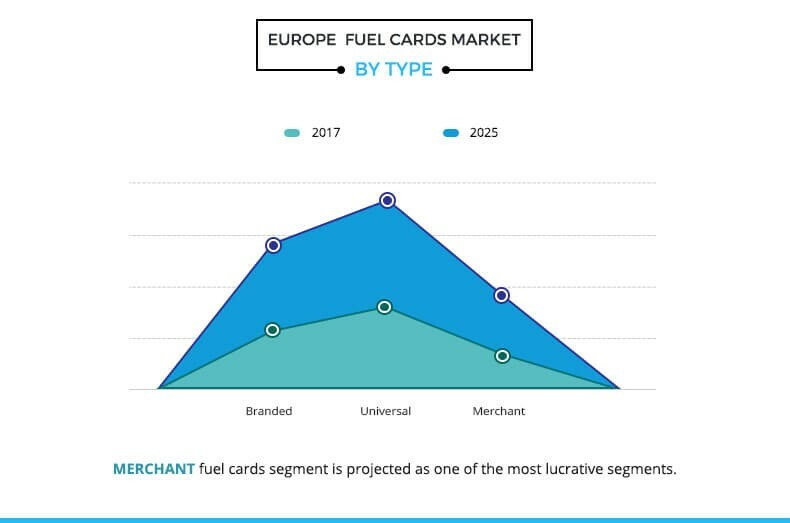 Moreover, adoption of Europe fuel card market has escalated over a period of time, owing to upsurge in digital transactions, increased market potential for prepaid cards industry, and rise in need for improved fuel management across Europe. Furthermore, development of the logistics & transportation industry has boosted the adoption of fuel cards for numerous applications, thereby boosting the Europe fuel card market growth. The Europe fuel card market is consolidated with the presence of key vendors constituting large market share. UK and Germany are the prime consumers of fuel cards. However, Italy is expected to witness robust growth in the near future, owing to rise in government regulatory policies for e-invoicing of fuel transactions. The key players profiled in the report include BP Plc., Engen Petroleum Ltd., Exxon Mobil Corporation, FirstRand Bank Limited, FleetCor Technologies, Inc., Libya Oil Holdings Ltd., Puma Energy, Royal Dutch Shell Plc., U.S. Bancorp, and WEX, Inc. These players have adopted various strategies to enhance their product portfolio and to increase their Europe Fuel Card market share. For instance, in March 2017, Esso and BP Plc. initiated a partnership contract through which Esso started accepting BP fuel cards at circa 860 Esso forecourts in the UK.